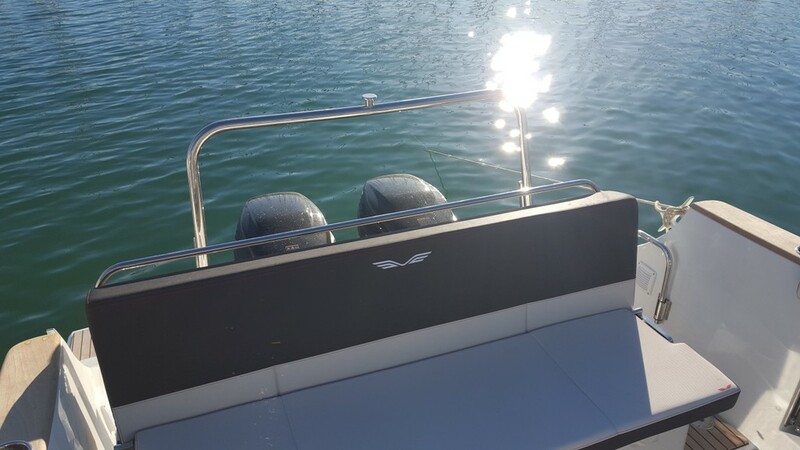 Immediately identifiable on the water by design codes from now well established, the new Sundeck Flyer 8.8 presents a conquering silhouette. Wide bow, profiled stiles and elegant design style windshield sign that clearly uncheck in the universe of the outboard. 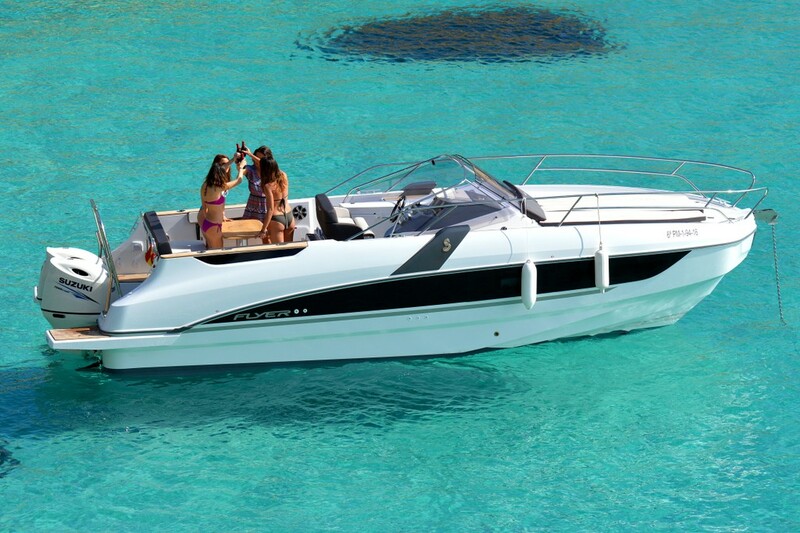 Concentrated technology, the new 8.8 is distinguished pair Flyer its marine facilities. 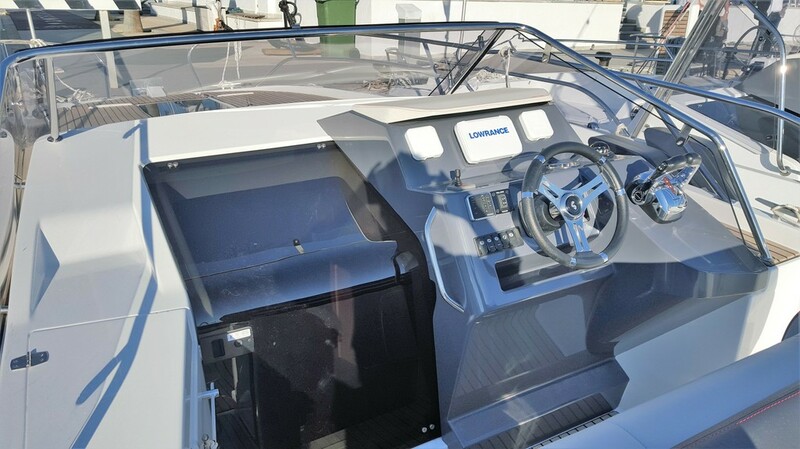 Equipped with the latest generation of fairings AirStep, it can accommodate up to 500CV motorization. 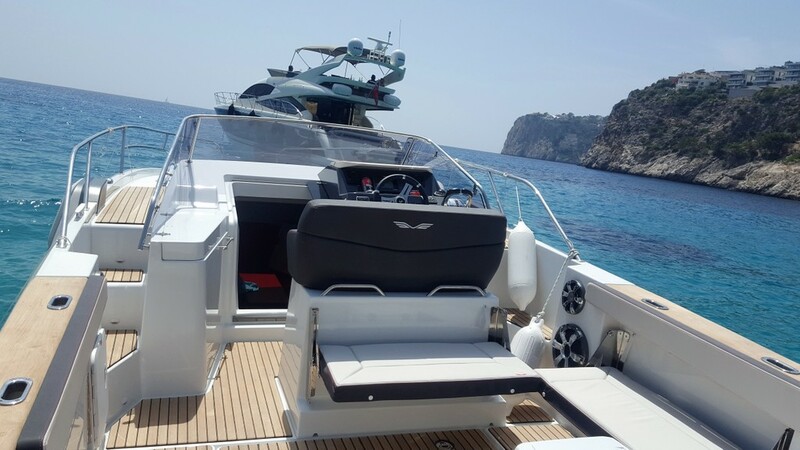 Being piloting a greater pleasure in this type of unit, the new Flyer 8.8 makes the perfect combination of sensations, comfort and safety. 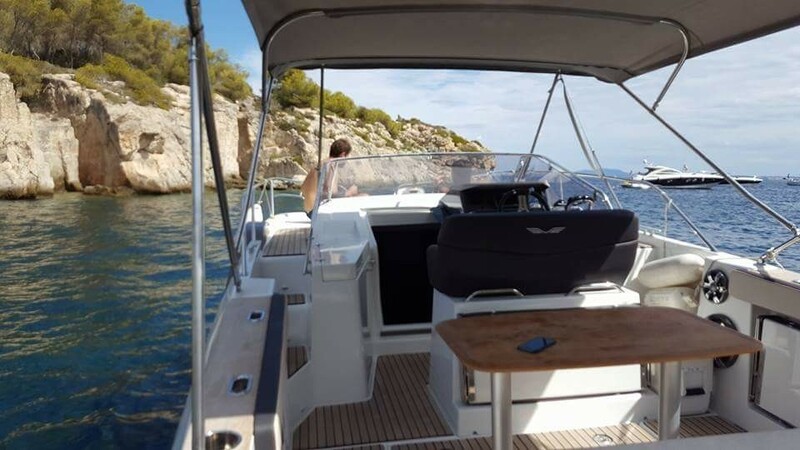 officially presented at the upcoming Festival de la Plaisance of Cannes, the Sundeck Flyer version 8.8 promotes liveability, rest and comfort of life to its fullest. 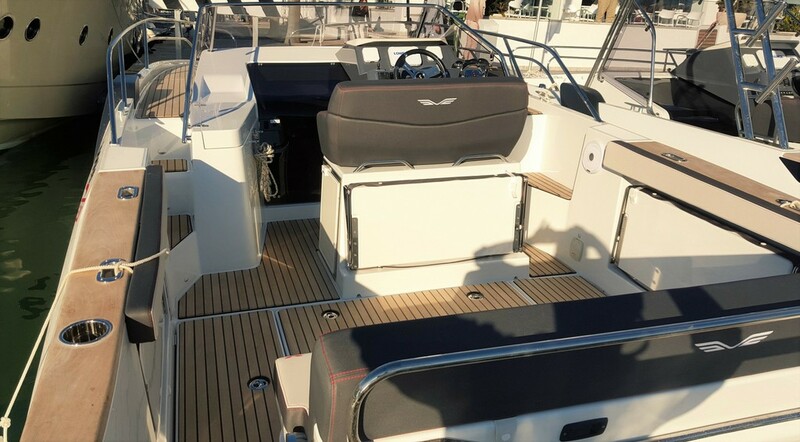 Particularly comfortable spacious aft bench becomes very simply in large solarium. Equipped with maximum details, the bow of the ship offers a solarium with two mattresses and headrest and coasters. Elegant and exceptionally spacious inside the Flyer 8.8 choose the brown / burgundy warm dyed. With its side windows, its deck hatch 'sky-view "and its portholes ventilation, cabin bow offers in his night configuration, two comfortable bunks, to become during the day in a large room that can muster a maximum of guests around of the table. A parking lot for your vehicle. Includes diving mask, a shaped tube called a snorkel, and usually fins. 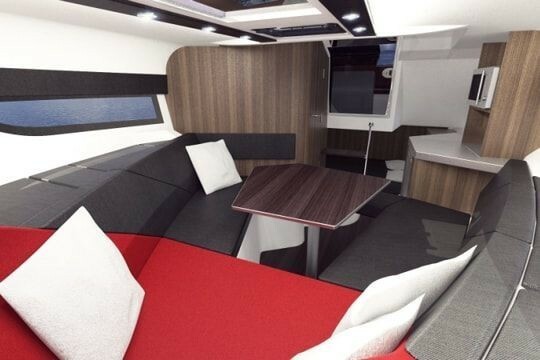 Allows the passengers to sleep on board the night of their last day of their reservation. If you visit the nature reserve of Cabrera, you need a permit. We will request it for you. Reservations will be effective and thus enters into full effect this contract, upon receipt in the offices of the leasing rate of 50% of the total price rent. Not been done before, the reservation must be paid, without fail, at the time of signing this contract. The rest of the rental price .You must be paid the day of shipment before delivery of the ship. Failure to pay will result in cancellation of the contract, leaving as compensation for the lessor the amount paid for the reservation. (3) On the day of embarkation the charterer will pay the lessor the deposit indicated in the specific conditions, and it will be used as a warrant against cancellations, repairs, breakages, damage, theft, delays in returning the vessel, differences in the inventory and equipment, compensation, improper use, negligence and penalisation of any kind agreed upon in this contract or which may arise as a consequence of fulfilment of said contract, the deposit will be automatically canceled by the corresponding bank in each case. All of which does not affect any legitimate legal action to claim amounts which may exceed that of the deposit. (1) The vessel which is the object of this contract is covered by an insurance policy delivering a copy documentation Boat,declares he or she is familiar with its contents and extent of cover, and undertakes to take whatever measures are necessary to act in accordance with the obligations described in it, and will be the sole responsible party for any consequences deriving from failure to comply with said obligations, if applicable. (1) All the consumed materials have to be refilled by the charterer. 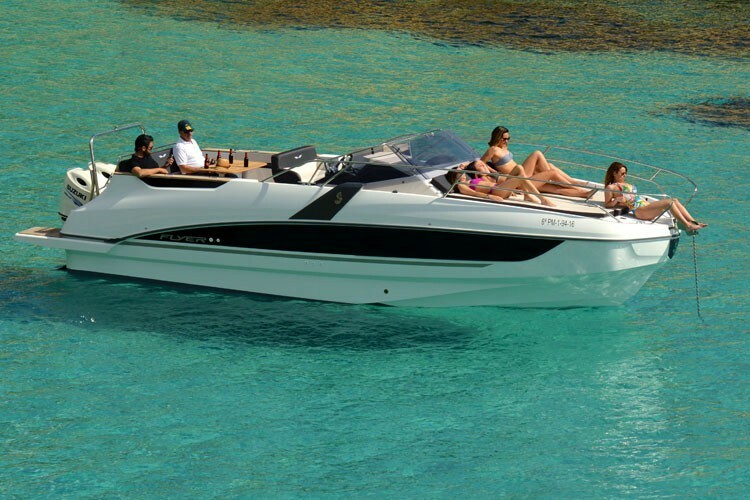 The yacht is taken will full tanks (fuel, water) and has to be given back with full tanks, in the presence of the owner. as it indicated / 2 months in advance 100% refund. / 1 month return 50% / 15 day refund 25% / 0% return days rest, is expressly recommends, simultaneous payment of booking cancellation insurance lease contracts. Powered by Andromeda Solutions. Web services: 0.00 s. Render: 0.17 s.